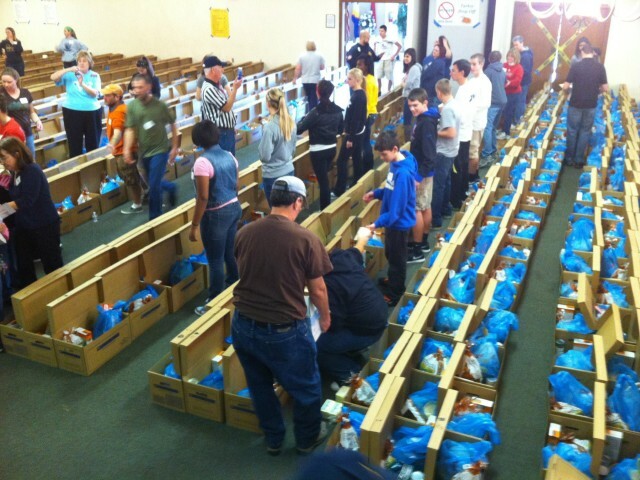 Since 1990, No Hunger Holiday has made Thanksgiving possible for hundreds of families in St. Charles County. Funded completely by the Knights of Columbus and contributions from concerned citizens and businesses, this program ensures that needy families have a complete Thanksgiving dinner that they can make in their own homes. Through donations, contributions, and volunteer work, the St. Charles community has come together to make Thanksgiving truly a No Hunger Holiday. More than 200 volunteers are involved in the filling and delivery of the food baskets on the Tuesday before Thanksgiving. These volunteers work all day to sort and fill each food basket based on the family size and special dietary needs which are indicated on the vouchers. Every year No Hunger Holiday receives many THANK YOU letters from recipients of the food baskets. The committee is convinced by the display of warmth and appreciation that this program is making a positive impact on the lives of the people. More than 50% of the Harvester Knights of Columbus council membership has an active role in the “NO HUNGER HOLIDAY” program. More than 6,000 volunteer man-hours have been expended on this project by the Harvester Council of the Knights of Columbus. This “NO HUNGER HOLIDAY” program truly shows all of us that we understand our duty to give THANKS for all God has given to us.